I’m Amelia a Life coach in Perth, I write, speak and teach meditation. It's my mission to guide women from inner critic to inner peace and help you bridge the gap between where you are, and where you'd like to be in your biggest, boldest dreams. I'm Amelia and I'm a Perth-based coach, writer, speaker and meditation teacher. I'm the creator of the Soul Sisterhood group mentoring program and online course, the Inner Peace Party Facebook community and in early 2019, I’ll be launching my soulful meditation app It's my mission to guide women from inner critic to inner peace and help you bridge the gap between where you are, and where you'd like to be in your biggest, boldest dreams. Unsure what the deal is with Life Coaching and whether it could benefit you? Let me break it down for you. 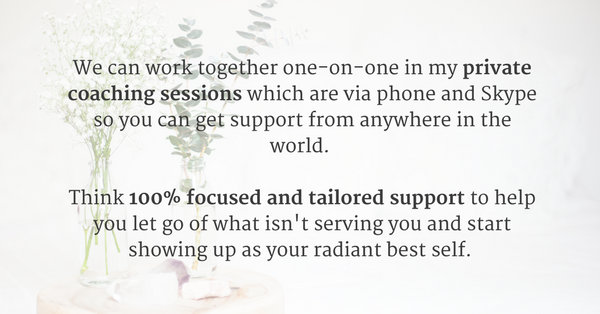 I also work with new coaches and online business owners to help them create purpose-fuelled and financially successful businesses that allow them to escape the daily grind and find true freedom and flexibility. If you like the sound of that, click here to learn more. If your inner critic is running the show, its going to be impossible to live that big beautiful life your craving. If you haven't been formally introduced to your inner critic, it's that self-sabotaging, self-doubting voice of fear that is playing of loop in the back (and often the front) of your mind. In my work, I combine my background in psychology and wellness coaching with intuition and energetic techniques to give my clients the practical, emotional, and spiritual tools they need to find inner peace and create a life of purpose, abundance, and peace. Read more about my background and qualifications here. It's my mission to help you wake up every day feeling inspired and excited. To support you to overflow with love, generosity, and energy. To uncover and live your passion and purpose. To enjoy inspiring relationships, a fulfilling career, and an abundant life. Click here to join my Happy Healthy Inner Peace Facebook Group for weekly inspiration and support! Amelia Harvey, BSc(Psych)Hons, is a life coach and meditation teacher who empowers women to connect with their intuition, uncover their true purpose, and embrace their inner goddess.